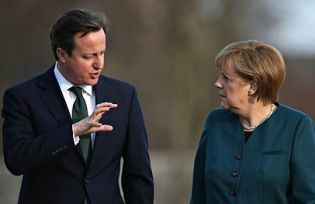 In a wholly rational world, the recent decisive election victory for David Cameron’s Conservative Party – and the implosion of the main opposition parties – would have created a favourable opportunity to resolve Britain’s long and difficult relationship with the European Union. The Eurozone, if it is to function or even survive, needs to become more integrated, while allowing certain EU states to remain outside it – at the moment Denmark and the UK, and perhaps future members unready or unwilling to adopt the single currency. There is therefore a need for a negotiated adjustment that would make it possible for the EU to function as an asymmetrical association, both economically and politically. The disaster of the Euro, and the rise of populist parties in many member countries, shows that the old pattern of ‘ever closer union’ has been tested almost to destruction. Opinion polls in Britain show that a majority favours membership of a ‘reformed EU’ – also the avowed policy of the Cameron government. A sensible deal could safeguard the interests both of Eurozone and non-Eurozone members. A subsequent referendum in Britain would, provided reform went far enough, endorse Britain’s membership, and do something to restore confidence in the EU project more generally. But we do not live in a wholly rational world, and so this outcome is far from certain. Britain has always been, and probably still is, the most consistently ‘Eurosceptic’ country in the EU – I use this term dispassionately to mean those who are sceptical of the idea of ‘ever closer union’ and a post-national “superstate” (to use Margaret Thatcher’s term). Many intelligent commentators outside Britain seem unable to understand this position, often dismissing it as merely the consequence of ignorance or a biased press. It might therefore be useful to begin with a brief summary of the foundations of British Euroscepticism. It has both ‘Positive’ and ‘Negative’ aspects. Positive: a deep historic attachment to democratic self-government, which forms a continuing theme in British history – or at least in the idea of a ‘history’ that the British cherish. The Magna Carta, which is widely celebrated this summer 800 years after its creation, is a symbol of the people asserting their power over their ruler. The EU, to put it mildly, is not a system in which popular power prevails, and many people in Britain are instinctively suspicious of a political Europe as an affront to national democracy. Negative aspects: the rather mystical attachment to the ‘European idea’ common on the Continent is weak, if not absent, in Britain. The country has not for many centuries suffered the trauma of defeat, invasion, occupation, revolution, civil war, or dictatorship. Its people do not instinctively feel the EU to be a barrier against such disasters, which they have no reason to fear. So public opinion generally sees the EU as essentially an economic organization. It is therefore far more thinkable than in other member states that the British electorate might vote to leave the EU if it thought that there were practical advantages in doing so, and this is what the debate in Britain largely concerns. British ‘Eurosceptic’ views should not be equated with insularity, xenophobia or reactionary politics, though they are often described as such by critics. On the contrary, they are often associated with a global vision of Britain’s economic and cultural links, a sturdy attachment to political accountability, and confidence in the country’s ability to prosper outside the EU. A minority of the public want to withdraw from the EU in principle – recent polling suggests about 18 percent would definitely vote to leave. But the great majority are undecided or in favour of membership of a ‘reformed EU’ – a very significant condition. Many of these would probably be satisfied with, what might seem quite moderate changes in Britain’s relationship with the Eurozone. For example, a recognition of the ultimate sovereignty of the British State (such as Germany has within its constitution), a recognition that Britain is not committed to ‘ever closer union,’ adequate protection for certain key interests (such as financial services), exemption from some labour market regulations, and modification of the rules over free movement in light of the unprecedented and continuing influx of immigration into Britain over the last twenty years. Whether such changes could be achieved under current EU law is the question, and it might well be that Britain would need to negotiate a new category of membership to satisfy its electorate’s desire for ‘reform’. Britain would thereby remain a member of the EU, a major trading partner with the Eurozone (whether technically inside the ‘single market’ or preferably with a simple free-trade agreement), committed to European security (with a remarkably close defence relationship with France), and supportive of Europe’s role in world politics. It would no longer be an awkward or obstructive member of the Union, and would have every reason to support the development of Eurozone institutions. So what is the problem? Not least, it exists within British politics, as the debate has become dangerously and irrationally polarised. This is partly the fault of David Cameron and the leadership of the Conservative party. Presumably for tactical reasons – to preserve party unity and please Eurosceptic voters – he committed himself to an ‘in/out referendum’ on the EU before the end of 2017 following a rapid renegotiation of Britain’s terms of membership, which so far has resulted only in vague hints of confidential discussions with other member governments. Cameron refused to state his aims in this renegotiation, but said that he will campaign for continuing membership – presumably, whatever the outcome. Given this vagueness about both aims and methods, there has not been, and cannot be, a serious debate about Britain’s future relationship with the Eurozone, or even how it is to be brought about. Instead, vocal minorities on both sides continuously present the ‘in/out’ issue in melodramatic and populist terms. On one hand, the most uncompromising Eurosceptic party, the United Kingdom Independence Party (Ukip), has made the issue above all about immigration, for which it argues that, given the legal and political commitment of the EU to ‘free movement,’ the only solution is to leave the EU. Although Ukip won only one parliamentary seat in the May general election – thanks to the non-proportional nature of the British electoral system – it won 13 percent of the vote. It has succeeded in winning support from all parties, and from both working-class and middle-class voters – the classic ‘populist’ stance. Although its electoral disappointment has led to damaging quarrels among its leadership, it would be hasty to write Ukip off in a referendum campaign. At the other end of the spectrum, a more inchoate ‘Europeanist’ tendency, which has no common organization, but which also crosses party and socio-economic boundaries, states the issue in even more melodramatic terms: any interference with British terms of membership risks condemning Britain to poverty, mass unemployment, a shrinking role in the world, cultural insularity, and a breakup of the United Kingdom. People who propound this view – some business interests, many academics, some Conservatives, rather more Labour supporters, most Liberal Democrats and Greens, most Scottish and Welsh nationalists – represent a diversity of interests (including neo-liberal, corporatist, ecological, socialist, and nationalist). But they usually proclaim an idealistic commitment to Europeanism as a badge of civic virtue, which often leads to the demonisation of those who hold different views. It is difficult to decide which of these polarised positions is more out of touch with reality. Oddly, they share one similarity: the assumption that Britain’s choice is either to merge into ‘Europe,’ or to leave the EU completely. The basic reality, however, is that in any imaginable future Britain will necessarily have a very close economic and political relationship with Europe, as it has had throughout its history, but that it will not be part of the Eurozone core. Even if it voted to leave the EU, it would merely revert to an economic relationship similar to those of Norway or Switzerland. The dangers of overlooking these simple facts in a highly emotional and polarised debate are multiple. The British electorate might be scared into voting “Yes” to a relationship they resent, which would simply perpetuate the existing problem. Or they might vote “No,” and the government would then be forced to negotiate a new relationship with the EU under Article 50 of the Lisbon Treaty, but in an atmosphere of ill will, uncertainty, and perhaps panic. Scottish separatism would be revived, probably leading to a break-up of the UK. All these outcomes would pose serious problems for the EU as well as for the UK. There is an alternative: that Britain would be allowed to negotiate a coherent non-Eurozone membership (which some other states might or might not wish to share). This outcome will require moderation, rationality and goodwill: let us hope these qualities prevail. Robert Tombs is Professor of French History at Cambridge, and is a specialist in modern French history and Franco-British relations. He has been particularly concerned with the Paris Commune of 1871 and with French nationalism from the 1830s to 1914. Among his recent publications are: Britain and France in Two World Wars: Truth, Myth and Memory, ed. with Emile Chabal (London, Bloomsbury 2013); Paris: bivouac des revolutions: la Commune de 1871 (Paris, Libertalia 2014) and The English and Their History (London, Penguin 2015).